I am the administrator of "Free Software User Group Italia". I am a member of Italian Free Software Foundation Europe Chapter. I am an openSUSE Advocate and recently I have been added to the group of openSUSE Local Cordinator. 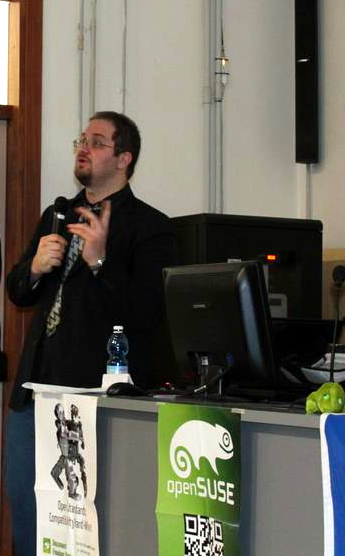 For years, I am committed to to introduce openSUSE around Italy, participating in numerous events to promote GNU / Linux. For business reasons, I was not possible to participate actively in the development and translation of openSUSE, even if the last period, on a personal basis, I'm testing some versions for ARM architecture. I hope in the future to be able to further increase my contribution to the project. This page was last modified on 9 December 2014, at 17:58.